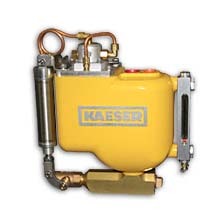 Kaeser Automatic Magnectic Drains (AMD) remove condensate and other contaminants from your air system. The large capacity of automatic magnetic drains makes them suitable for a broad range of applications. Highly dependable and requiring little maintenance, automatic magnetic drains maintain a “liquid seal” which prevents compressed air loss. Unlike traditional float drains, the operating mechanisms are isolated from condensate so no fouling or sticking occurs.